Java 9 already in full swing and ready for feature complete by end of May. Even though Java 8 released couple of years back, I’m sure there are veryfew companies moved to even Java 8 JDK for their production environment. Few still uses JDK7 and JDK6. Java 8 by default comes with lots of smart features which I believe we hardly looked at. Sometime back I’ve written an article on Java 8 Stream API Operations and Lambda Expression. In this tutorial we will go over steps and how we can use Java 8 Stream package to read file content line by line. If you want to go over traditional approach (pre Java 8) then follow this tutorial which uses FileReader and BufferReader utils. Also, if you have below questions then you are at right place. We are going to create read line utility using two below approaches. Create different methods for each utility. collect performs a mutable reduction operation on the elements of this stream using a Collector. Here is details. I would suggest to go through it thoroughly. 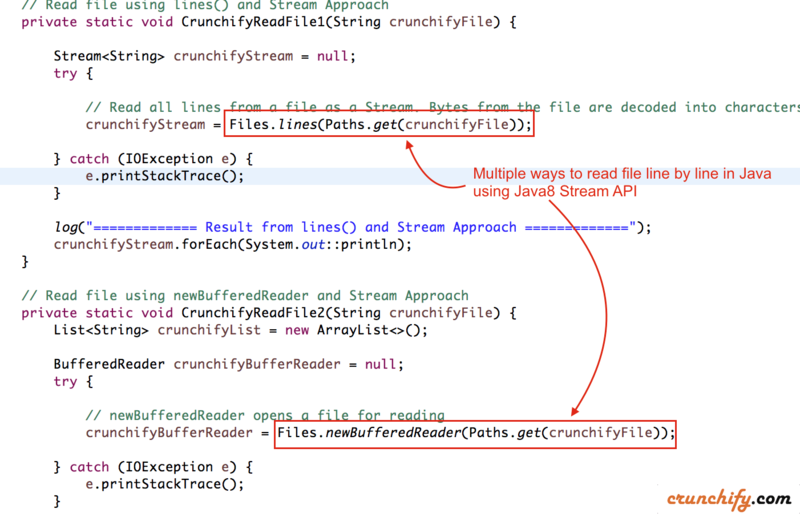 We will read file crunchify-java8-stream.txt with below content. Copy the content and put it into your C drive or Mac’s Downloads folder. // action throws an exception.